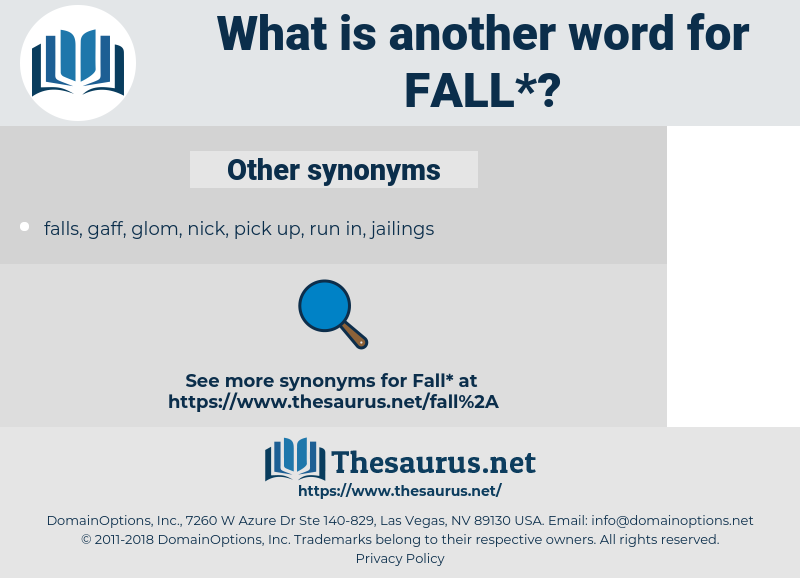 What is another word for fall? 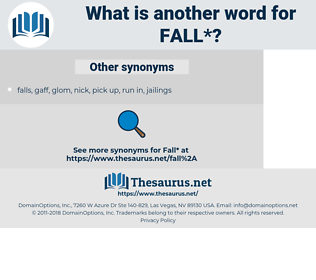 occur at a specified time or place; " Christmas falls on a Monday this year"; " The accent falls on the first syllable"
falters, fades, Resources, Narrows, dive, Was, reviews. plummets, reductions, Lives, sags, provinces, months, fades, cuts, Narrows. dive, lapse, failure, depreciation, overthrow, nosedive. collapsed, plummeted, slumped, downgraded, Withdrew, Dwindled, nosedived, rolled, Shrank, landed, Toppled, Slowed, retracted, changed, Trailed, softened, contracted, Happened, Caused, showed, backed, eased, Rang, Did, Plunged, lowered, Slipped, Sank. belong, come, float, descend, enter, fit, become. shrinks, plummets, loses, weakens, wanes, applies, happens, Does, Narrows, declines. planned, projected, cases, plummet, belongs, belong, lay, diminish, depreciate, lapse, shrink, reducing, come, overthrow, FAII, descend, dwindle, enter, crumble, fit, become. falling, downturn, demise, diminution, contraction, devaluation, deterioration, drop-off, lowering, snowfall, ouster, loss, disintegration, capitulation, resignation, decadence, breakdown. creation, development, win, accomplishment, fighting, building, growth, achievement, fight, elevation, construction. evenness, perfection, enlargement, scaling, rise, success, increase, ascent, climb, level. keep up, keep pace, make progress. heightening, betterment, continuation, flower, flourishing, renewal, uptick, uphill, flowering, prime, improvement, aggrandizement, exaltation, upswing, pitch, progression, enhancement, lean, extension, tilt, soaring, restoration, Glacis, heyday, up, headway, rake, upturn, blossoming, evolution, hill, uptrend, revitalization. extend, advance, overcome, develop, overthrow, lose, expand, raise, strengthen, progress, reach, attain, go up, praise, ascend, grow, enlarge, scale, compliment. But Rennie did not fall back. foul, flaw, fail, foible, fella, foully, flay, flail, fellah, faille, fallow, faull, fell, fowl, fallal, fool away, flea, fable, FAUL, folly, felly, foal, fully, fula, fille, file away, fulah, folie, feeble, fool, felloe, fill, file, fl, faal, flyaway, fellow, flow, flywheel, fibula, flue, fipple, pfahl, Fa La, fuel, flow away, flu, fuel oil, follow, filly, flyway, filial, FAHL, Fal La, flee, floe, foil, feel, fall away, falla, fly, full, folio, Ful. fall out, pass, vanish, begin, come out, change state, be born, disappear, set about, go away, happen, hap, come forth, pass off, get down, go on, occur, go forth, start out, turn, emerge, commence, set out, egress, come about, change, issue, get, take place, start. locomote, travel, change posture, go, pitch, slope, move, incline. miscarry, quit, step down, fail, transgress, go wrong, trespass, fall, sin, resign, leave office. fall out, pop off, go on, buy the farm, die, be, pass off, exit, croak, decease, cash in one's chips, kick the bucket, happen, give-up the ghost, pass away, perish, take place, choke, conk, snuff it, occur, go, pass, expire, come about, hap, drop dead.